Amazon Elastic File System lets you create petabyte-scale file systems that can be accessed in massively parallel fashion from hundreds or thousands of EC2 instances and on-premises servers, while scaling on demand without disrupting applications. Since the mid-2016 launch of EFS, we have added many new features including encryption of data at rest and in transit, a provisioned throughput option when you need high throughput access to a set of files that do not occupy a lot of space, on-premises access via AWS Direct Connect, EFS File Sync, support for AWS VPN and Inter-Region VPC Peering, and more. Today I would like to tell you about the new Amazon EFS Infrequent Access storage class, as pre-announced at AWS re:Invent. 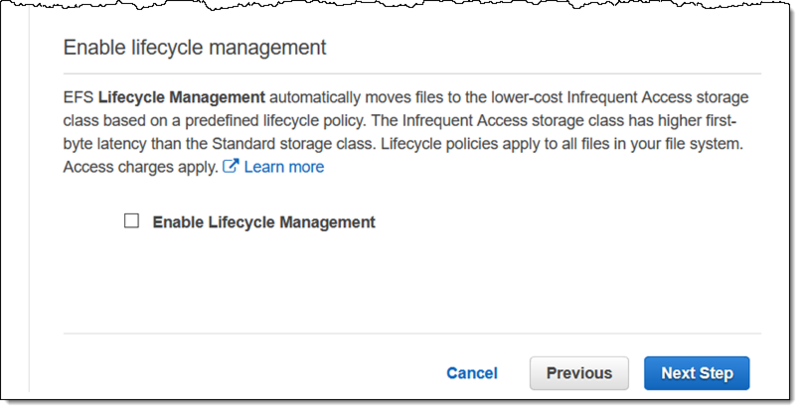 As part of a new Lifecycle Management option for EFS file systems, you can now indicate that you want to move files that have not been accessed in the last 30 days to a storage class that is 85% less expensive. You can enable the use of Lifecycle Management when you create a new EFS file system, and you can enable it later for file systems that were created on or after today’s launch. The new storage class is totally transparent. You can still access your files as needed and in the usual way, with no code or operational changes necessary. You can use the Infrequent Access storage class to meet auditing and retention requirements, create nearline backups that can be recovered using normal file operations, and to keep data close at hand that you need on an occasional basis. Priority – Operations that transition files to Infrequent Access run at a lower priority than other operations on the file system. Throughput – If your file system is configured for Bursting mode, the amount of Standard storage determines the throughput. Otherwise, the provisioned throughput applies. As I noted earlier, you can check this when you create the file system, or you can enable it later for file systems that you create from now on. Files that have not been read or written for 30 days will be transitioned to the Infrequent Access storage class with no further action on your part. Files in the Standard Access class can be accessed with latency measured in single-digit milliseconds; files in the Infrequent Access class have latency in the low double-digits. Your next AWS bill will include information on your use of both storage classes, so that you can see your cost savings. This feature is available now and you can start using it today in all AWS Regions where EFS is available. Infrequent Access storage is billed at $0.045 per GB/Month in US East (N. Virginia), with correspondingly low pricing in other regions. There’s also a data transfer charge of $0.01 per GB for reads and writes to Infrequent Access storage. Like every AWS service and feature, we are launching with an initial set of features and a really strong roadmap! For example, we are working on additional lifecycle management flexibility, and would be very interested in learning more about what kinds of times and rules you would like. PS – AWS DataSync will help you to quickly and easily automate data transfer between your existing on-premises storage and EFS.